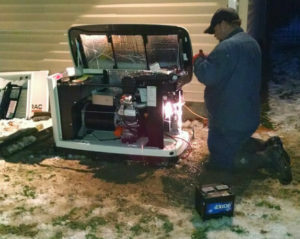 A Hunter & Lomison service tech performs an emergency standby generator replacement. Generators require maintenance. A generator that hasn’t been properly maintained and inspected annually will often become not much more than a lawn ornament when the power goes out. People purchase and install generators for a wide variety of reasons, but it’s probably safe to say that “decoration” is not one of those reasons. They want it to work when they lose power! out of adjustment but is crucial to proper system operation. While the generator itself exercises weekly (or if it doesn’t, we can take care of that, too, while on site), it doesn’t generally exercise under load, which means that the automatic transfer switch is not being used and the contacts can become dirty. We test your system using the switch and if there is a problem we can clean the contacts and/or work the switch manually until it is performing correctly. Think of the difference between a window that is opened and closed regularly and a window that has remained closed for a couple of years; the latter will not be as easily opened and closed as the former but will become so the more it is worked. The technician will alert the customer to any potential problems – such as a battery that has become too old to be reliable – and the steps to take to ensure the system is ready to produce power when you need it. No repairs will be performed without the consent of the customer and a quote is always quickly available so that the decision can be made while the technician is on site. the area so that travel expenses are shared and thus minimized for the individual customer. Unfortunately that is not usually possible for emergency service calls, many of which can be prevented with scheduled preventive maintenance. Scheduled preventive maintenance is available on a no-contract annual and semi-annual basis or can be had with a long-term flat rate contract. Either way, Hunter & Lomison will maintain the schedule, contact you when your generator’s service is due, and maintain an individual file for your service records. We will also customize your plan to fit your individual needs, such as service intervals (for units with higher than average usage or an accelerated service interval running environment), seasonal accessibility, or your own personal schedule. Hunter & Lomison is committed to providing our customers with high quality, comprehensive, and affordable service for your generator and automatic transfer switch. Please Contact Us to discuss your needs or obtain a written quote that will be valid for 12 months. We carry maintenance kits for standby generators and more in stock!